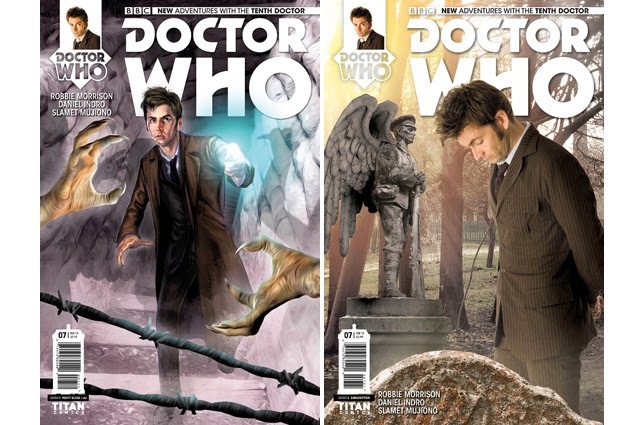 DOCTOR WHO: Titan Comics - "The Weeping Angels of Mons" Review | Warped Factor - Words in the Key of Geek. Tony Fyler hasn’t blinked in days. Part of the fundamental joy about Doctor Who is its freedom to be anything, to go anywhere. That translates into media as freely as it does in the imagination – books, audio plays, online fan fiction, and comic strips are just as fertile a ground in which the Doctor can have adventures as the official TV show. This is a truth that kept the annuals filled, that launched the careers of many of today’s TV Who writers in the Virgin New Adventures, that has kept Big Finish in business for fifteen years, and that since at least the 80s has made the comic strip in Doctor Who Magazine a highly respectable medium in which the Time Lord can live. It’s time to welcome a new player to the prism of new Who adventures. Titan Comics has commissioned original stories and turned them into comic books, interjecting new ideas into the mythos, giving die-hard fans new sparks for their imagination, and perhaps just possibly even winning some harder core comic book fans to check out the Doctor in other formats too in a geeky medium-crossover. The Weeping Angels of Mons is a new story written by Robbie Morrison and drawn by Daniel Indro, and, as you’d expect, given the ‘Robots of Death’-obvious title, it features everyone’s favourite quantum locked life forms on a major battlefield from World War One, where death is a practical certainty and the Angels can feed at will. There are many good things on offer here. The central concept is one of those ideas that once it’s been pointed out to you, makes you wonder why no-one’s thought of it before (a sure sign of a solid Doctor Who idea that, if it feels like it always should have been a story). The personality of the Tenth Doctor is strongly in evidence here too, the words leaping into your brain with the faux-cockney and the cheeky grin all in place. And while for the sake of any potential newbies to the world of Who or the Angels in particular, there’s a lot of expositional explanation about what the Angels are, how they work and what, for instance, could defeat them (much of it, by the nature of its fundamental re-statement of what is to Whovians familiar territory, feeling borrowed from the Angels’ TV appearances) parts 1 and 2 of The Weeping Angels of Mons do manage to build a new and crucial element into the Angels’ mythos. The Doctor famously said they zap you into the past and let you ‘live to death’, while feeding on your residual time energy. But of course, if you give that a moment’s thought, it makes a macabre sort of sense that it’s not in the Angels’ interest for you to live full, rich lives in the past. And they decide where and when to send you to. There’s a proper shudder here as that concept is unpacked for readers over a handful of pages, particularly as the ‘pre-credits sequence’ of part 2. What’s more, the Angels work in a comic book setting – they just do. A world of angles and shadows is perfect for these lurking creatures, and the setting of Mons in particular – a ruined town, all devastation and broken buildings – leads to several moments of ‘stupid place to put a statue’ revelation which wouldn’t work in a more civilised environment. There’s also, it’s worth mentioning, a properly horrible moment in part 2 that shows quite how seriously some people take the ‘Don’t Blink’ imperative. Good, dark, comic book noir, that moment – you won’t miss it when you see it. There’s solid Tenth Doctor comedy here too, and the pacing feels right, like a TV episode on fast forward, snapping between high drama and light froth. In the grand tradition of the Doctor in non-TV media, he has a new companion, American would-be artist Gabby Gonzalez, and there’s a degree of high-speed zing between the two that promises much going forward. The comics are not yet perfect though – in an attempt to deliver the horrors of war, there’s a burden of expositional eloquence laid on the lips of a Scottish soldier of the period, where it doesn’t really belong, while at the same time, he jokes in a letter home to his sister about the flatulence of one of his comrades, which seems like an off note, a too-modern misplayed chord. But to be fair, Morrison’s story for the most part bowls along, hurling the reader into the action and propelling them through with a believable Doctor in a realistic, terrifying situation. The biggest distracting note in these two parts of the story is actually Indro’s rendering of the Tenth Doctor. The covers are stunning, whereas Indro’s panels, while delivering all that atmosphere of the ruination of war and the slyness of the Angels, rarely, if ever yet capture something you’d necessarily pick out of a cosplay competition as a winning Tenth Doctor. The figure looks many things – cross, joyful, curious, commanding, arrogant…it just, so far, manages to be all of these things without ever looking like the Tenth Doctor. Does this ruin the book? That probably depends what you’re reading it for. Here, the story’s strong and the dialogue works so well that you conjure the Tenth Doctor from it anyway and read on, rapidly. If you’re reading the comic book looking for pin-point accurate renderings of your spiky-haired Time Lord, you’ll probably be disappointed, especially by the bait-and-switch of the cover looking so realistic. And again, it’s important to remember that Indro’s artwork delivers much of the atmosphere of the piece and gives you the shudders and chills of an Angel story in World War One. The difficulty with the renderings of the Tenth Doctor don’t make this something you shouldn’t buy. It just means it’s only a must-buy, rather than a sell-your-granny-to-buy, new story. 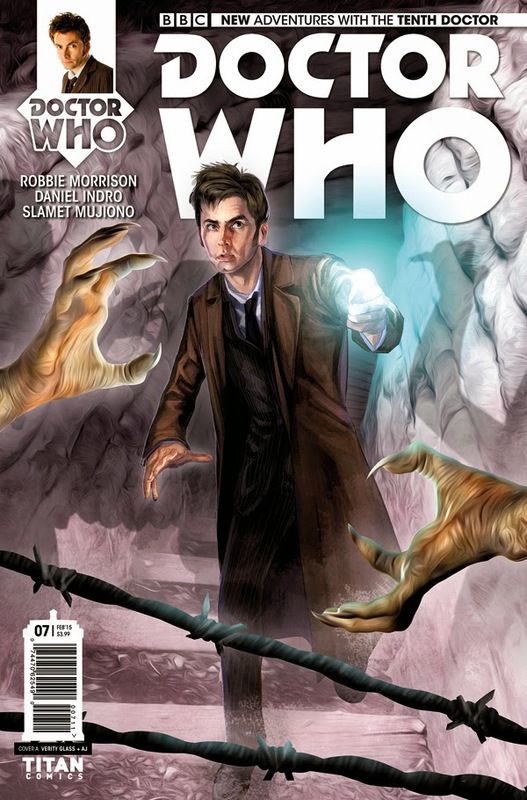 As an example of the sort of work Titan Comics is doing to bring new Who stories to a slavering fandom, The Weeping Angels of Mons is a great jumping-on point, because a) Did you miss the part where it features the Weeping Angels? b) It’s atmospherically drawn in a way that gives you chills when you see the Angels in the background, and c) It delivers, in story and dialogue if not quite yet in artwork, a realistic Tigger-bouncing Tenth Doctor that reads as authentic enough to be narrated by Tennant himself. 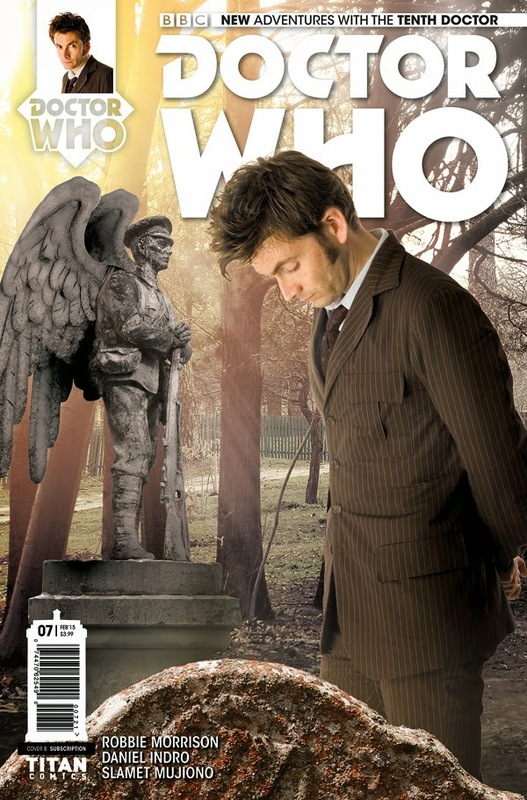 The Weeping Angels of Mons, Parts 1 and 2 are in The Tenth Doctor #6 and #7. Issue #6 is available now, and Issue #7 will be released on February 3rd 2015. Check them out now to find out what the Angels did next.